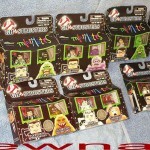 Our Featured Ebay Auction is for a Lot of 10 Ghostbusters Minimates 2-Packs. The lot will quickly catch you up on the first 2 waves of the series. It comes from seller stewnami. Ghostbusters have been making larger and larger waves lately. Want to see what else is out thee? Check out more Ghostbusters Listings to see what you’ve missed.